Obituary: John T. Burkey, formerly of Coaldale and Coopersburg, PA, died Sunday, December 16, 2018, in Largo, FL. A member of the Coaldale High School Class of 1963 before moving to Coopersburg, John is survived by his wife Debbie, brother Thomas, sons, daughters, and grandchildren. Private services were held for the family. 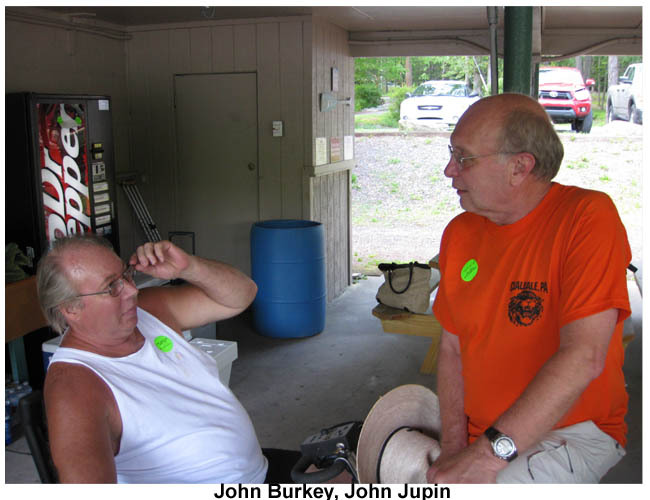 John Burkey is shown here (on the left) speaking with John Jupin in 2013 at Lake Hauto at the 50th Class Reunion picnic of the Coaldale High School Class of 1963. John Burkey is also shown here (seated, in dark jacket) at the Lithuanian Club cabin in Lake Hauto, circa 1954, with fellow CHS Class of 1963 classmates John Jupin, Mike Panchura, and Basil Adamitis.